Mary Kom is an Indian boxer and the only women boxer in India who had won bronze medal in the Olympics. Besides wining Olympic medal, she is also five time world boxing champion. The full name of Mary Kom is Mangte Chungneijang Mary Kom. 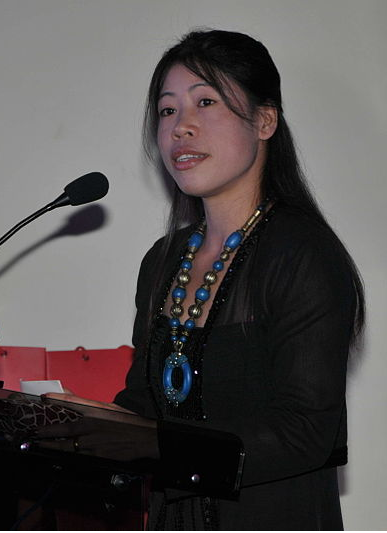 Mary Kom was born in Kangathei, Manipur, India on 1 March 1983. Her parents are Mangte Tonpa Kom and Mangte Akham Kom. Her husband is K Onler Kom. She is mother of twins Rechungvar and Khupneivar. She completed her graduation from Churachandpur College. As boxing for women was not a suitable sports, she tried to hide her interest from her family. Her family came to know it through a newspaper when she won Manipur state boxing championship in 2000. She started boxing in the international level only at an age of 18. She won 5 gold medals and one silver medal in Women's World Amateur Boxing Championships. She had to gain weight for the Olympics as there were only three categories. At 2012 Olympic she fights under 51 kg category and won bronze medal. At an interview she apologies to the people for not wining gold medal. For her tremendous performance she has won many awards and accolades. She won Arjuna Award,Padma Bhushan and Padma Shree awards in 2003,2013 and 2006. She is also called “Magnificent Mary” for her performance. Name: Mangte Chungneijang Mary Kom. Family: Parents:Mangte Tonpa Kom and Mangte Akham Kom,Husband:K Onler Kom,Children:Rechungvar and Khupneivar.